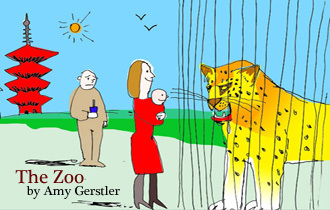 Amy Gerstler takes us to the zoo. A strange temple to some, where the gaze is exchanged inconspicuously between one species of animal captivated in reposing gawks and a variety of others held in captivity. No tiger attacks here on this day, but, careful there, don’t lean too close… Art by Danny Jock.